Fancy some mesmerising tights? Nike Pro Women's Training Tights are just what you need! When you look on Instagram and start browsing fitness accounts it’s easy to get lost in the sea of Gymshark goodies. 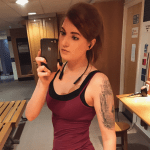 Now, I’m not opposed to Gymshark, in fact, I’ve heard from many that their kit is top notch (Sam recently reviewed the Vital Seamless T-Shirt and Mala recently reviewed the Seamless Energy High Waisted Cropped Leggings), but I wanted to try out an old favourite of mine: Nike. I am partial to a pair of colourful, patterned leggings so when I saw these Nike Pro Women’s Training Tights with this oil slick design on the Nike website, I knew I had to have them. I’m usually pretty wary of purchasing leggings on any website no matter how established they are. Purely because my legs are like fleshy trees and account for 90% of my body. On this occasion, I threw caution to the wind and decided to nab them anyway. Personally, I’m not too keen on three-quarter length leggings because they just end up looking knee-length on me, being almost 6 foot tall, and I do find that some full-length leggings just aren’t long enough for me. Ordering these, I was hoping and praying these bad boys would be at least ankle length. Anything above the ankle I had already mentally decided would be returned straight away. When I initially unpacked the leggings, I was not filled with much hope that my ankle-length legging dreams would be fulfilled – they looked short and tiny. I was concerned to say the least. However, after trying them on at work (I couldn’t wait to find out whether I would be celebrating or commiserating) I was delighted to see that the Dri-FIT fabric grazed my ankle and I let out a little cheer. These leggings have a compressive design, which aims to deliver the utmost comfort. The material aims to keep you dry even during the most gruelling workout sessions, designed with comfort in mind and the seams are completely ergonomic which promotes natural movements. Does Nike have a wide range to choose from? These leggings are available in sizes XS (4-6), S (8-10), M (12-14) and L (16-18), and two variations of colour in the oil slick design; ‘Dynamic Yellow’ and ‘Crimson Pulse’. I decided to go for the Dynamic Yellow design. Heads up, I’m not 100% sure why it’s called Dynamic Yellow as the design is definitely more of a blue-ish, grey, black hybrid. The pattern on these leggings is definitely one of the main reasons I chose to purchase the leggings – there are elements of a rainbow hue weaved into the navy, black and grey design which I greatly appreciate. Do Nike Pro tights fit well? Well, the leggings are definitely tight, but I kind of like it. The material hugs my legs in such a way that accentuates even the tiniest amount of muscle definition. If you’re a novice gym-goer like me, that’ll make you feel good. Due to the snug-as-a-bug fit, there is a slight opacity issue on the buttocks. Awkward. But if you tend to wear black pants to the gym, this shouldn’t be an issue. It’s definitely less noticeable than other pairs of leggings I own. Are Nike Pro tights comfortable during a workout? These leggings are not high waisted which I found difficult to get used to initially. I am normally an avid high waisted legging wearer so I can keep my gut pouch in order. This time I wanted to try some regular leggings out, what other place to start? When I did work out I noticed the band would move down below my belly button which definitely made my pouch of belly fat come out to say hello, but this wasn’t too distracting. I would say that if you are self-conscious about your stomach than these leggings may not be for you. They are incredibly well ventilated; the mesh sewn into the leggings helped here, keeping my legs cool during even the highest impact workouts. In other leggings, I usually emerge a soaking bundle of mess but these were dry as a bone. It was 10/10 having my gym buddy @winggfashion back. Not only is it fun to workout with her but she can take pictures of me as I prepare to squat so I don’t look like a mental vain person who just takes selfies alone in the gym 😅 although I definitely do that. Are Nike Pro tights pricey? I always expect well-known brands to be expensive. I tend to flock to Primark on payday over Selfridges but when I found myself browsing the Nike website, I was actually pleasantly surprised by the cost of their items. You will obviously find some items on there for those with a bigger budget, but you can get a decent number of products at around the £40 price mark. These leggings came in at £37.95 – a complete steal if you ask me. I really enjoy these leggings. They look cool, which means they will give me endless opportunities to be vain for my Instagram account. Thank god they reach my ankles (I will forever go on about this). They fit snug and they keep me from emerging from the gym as a sweaty mess. As long as you aren’t too self-conscious about your lower belly these truly are the leggings for you.